A rare 1927 art book bound with nuts and bolts featuring the work of the Italian Futurist Fortunato Depero may be reprinted as a near-perfect facsimile edition thanks in part to the efforts of Raffaele Bedarida, assistant professor of art history in the Faculty of Humanities and Social Sciences. 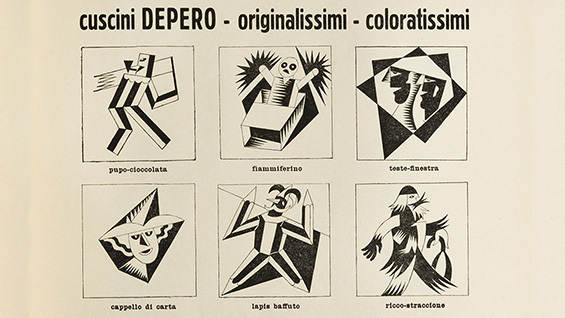 The organizers hope that a Kickstarter campaign beginning this week will generate funds enough to publish Depero Futurista (Depero the Futurist), a key work in the history of books as art objects. 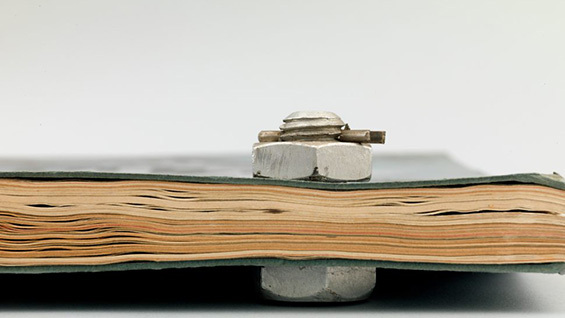 A monograph of the artist's works in painting, graphic design and even home decorating, it is known among aficionados as the Bolted Book for its unusual binding that uses two aluminum bolts and nuts to keep the pages together. They can be disassembled and the pages removed for mounting or otherwise. "Some art historians go so far as to say this is the first artist's book." Professor Bedarida says. "I am not so sure. Anyway it is a milestone in the history of the book as an object and in the history of the avant-garde." Depero, at left in a detail from the book, a less well-known member of the Futurist artistic movement that originated in Italy, created the book just prior to arriving in New York for an extended stay. He considered it a portable museum and used it to promote his work across media including architecture, set design, painting, prints, advertising and even a line of throw pillows. As a member of a movement that sought to wreck divisions between art and life -- one manifesto he co-authored proposes turning the entire cosmos into a Futurist work -- Depero lived in Chelsea where he established the Futurist House that fostered interdisciplinary collaborations of artists, artisans, industrialists, and entrepreneurs. Professor Bedarida characterizes it as a "proto-Warholian Factory." 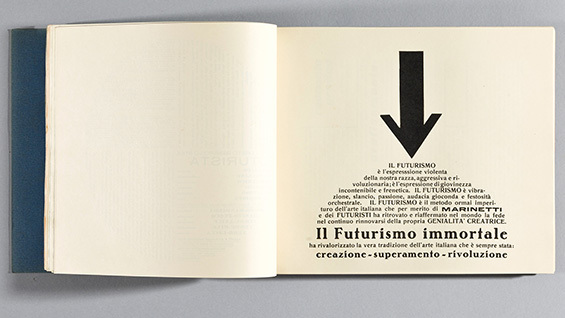 Only a few copies of Depero Futurista still exist. Apart from its unusual binding, the book contains examples of radical graphic design and typography. One essay must be read by rotating the book around 360 degrees. Though most of the text is in Italian a concurrently published Reader's Guide will translate the work and offer new perspectives by art historians. But even without reading it one can marvel at the innovative layout as well as the radical -- for then -- reproductions of traditional artworks like paintings and sculpture alongside commercial works like his series of ads for Campari. Perhaps most surprising is the examples of designs for throw pillows he designed and sold in Italy. Once in New York he convinced Macys to sell more of them. "I had this intense encounter with Depero when I did a fellowship at the Center for Italian Modern Art [CIMA] in SOHO in 2013. They had a one-year exhibition on Depero and they selected scholars to do research during that time. Because the book can be deconstructed and mounted, the Center covered an entire room with pages from the book. We had two copies so we could show both sides." At the time Professor Bedarida made a video about it. It left an indelible impression on him and he advocated for a facsimile edition. The book has been reprinted before but those have included introductory essays and new page numbers. This effort will be to reproduce the book as exactly as possible, requiring a team with specialized expertise to source materials and manufacturers for the various components of the book that are, in many cases, no longer in existence. These include six varieties of paper stocks of different colors, weights, and textures, carefully matched to the originals; and specially commissioned replicas of the 1920s aluminum industrial bolts, which will be crafted in Italy. The book will be printed and hand-assembled by one of Italy’s finest art book printers. 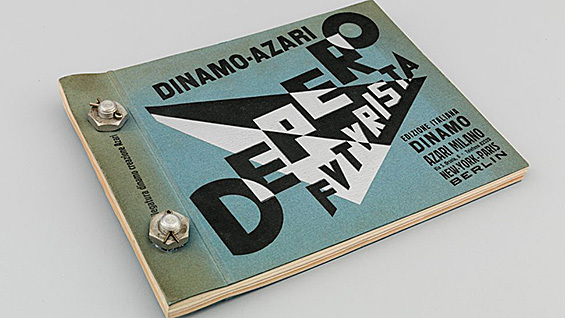 The reproduction, if funded, will be a collaboration between Designers & Books, CIMA and the Museum of Modern and Contemporary Art of Trento and Rovereto, Italy, which houses the Depero archives. On November 3 Professor Bedarida will appear at CIMA, alongside Laura Mattioli, its founder-president, to discuss Depero Futurista and its impact. Depero Futurista is one of the defining works of Futurism and was dubbed “a typographical racing car” by Futurism’s founder, F. T. Marinetti. But it is also a-typical of a movement so heavily focused on the aesthetics of industry and machinery. "The book contains these playful and fantastical images, pillows, toys etc., which look so different from orthodox Futurism. I think it will be of interest to a wider public than just collectors or institutions," Professor Bedarida says. "I would love to have one and show it to my students at Cooper!"